Seabrook Land uses lasso CRM homebuilder software to manage buying process and sell more homes. Lasso Real Estate CRM Software provides the tools and technology framework for sales and marketing success. Lasso Data Systems the leading CRM software for home builders and developers is pleased to be integral to the success in the ongoing development of the Seabrook, Washington master-planned community. In early 2011, Seabrook Land Company implemented Lasso to capture and manage all leads with standardized follow up processes that help guide the Seabrook sales team to communicate, nurture and build relationships with prospective homebuyers. Lasso CRM software provides the tools to implement multiple automated follow up processes and obtain real-time analytics based on the buyer’s interest and their engagement level at the website and with the sales team. “The degree of insight that we've obtained about our prospective buyers has been nearly mind-blowing and has really helped us better serve our potential home buyers,” stated Chris Murphy, Vice President of Business Development, Seabrook Land Company. “Speed of response, consistent processes and personalized communications with our prospects are all essential. Lasso’s built-in email marketing system has empowered us to take our communication and customer relationship strategy to the next level. As someone obsessed with both offline and online web analytics, Lasso CRM is one of the most important elements to our customer intelligence efforts,” added Murphy. “Seabrook Land is developing a unique beautiful beach community in Washington so it’s not surprising that their marketing and sales strategy is also progressive and innovative. We are proud to provide the CRM software tools and automation framework to help them successfully market and sell their homes,” acknowledged Dave Clements,” CEO, Lasso Data Systems. “We believe our home builder software needs to go far beyond a lead management system – Lasso must help the frontline sales team sell and increase referrals while providing management with real-time information and analytics for fast informed decisions 24/7,” added Clements. Established in 2004 on the Washington coast, Seabrook is a growing pedestrian-friendly town, which currently has 200 homes with plans to expand to 303 single-family homes. Seabrook is home to 50 permanent residents and more than 35,000 vacationers each year through the vacation rental program. Tourism is a growing economic sector in Grays Harbor County. Their current Beachhouse for a Year campaign has attracted attention in the area. 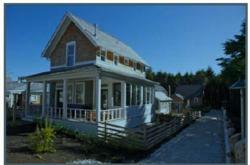 For more information visit http://www.seabrookwa.com.